It’s Thanksgiving morning and I have decided to make Apple Strudel Pie for our family gathering. As I began my search for a new desserts for the holiday season I had a handful of request and comments about posting recipes with only three to five ingredients in them. Five ingredients is “do-able”, but three? Uhhhh? Okaaaaay. Really? I understand that many people don’t have a lot of time to cook or bake from scratch, so I will be mindful of testing recipes that are less ingredient heavy in the future. But I can’t promise to find great recipes from scratch that only have three ingredients, perhaps five, but three? 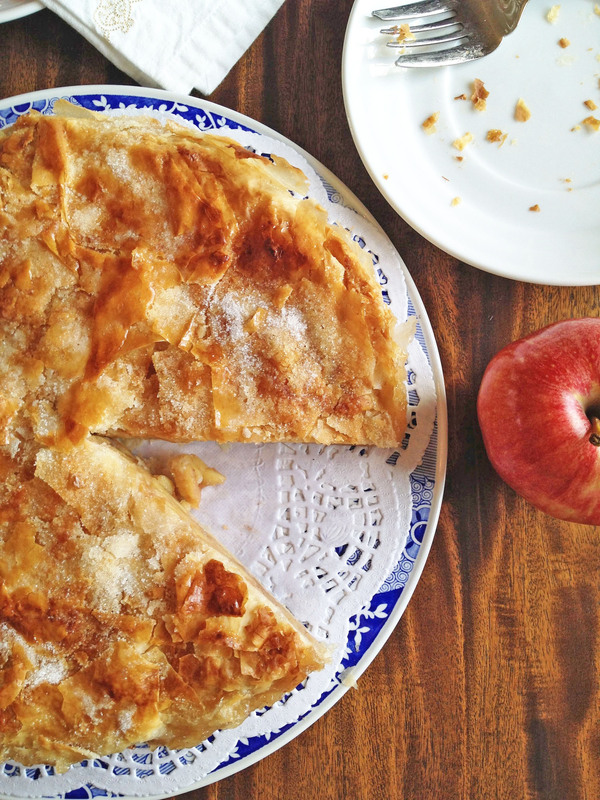 So, for those who have requested fast and easy baking ideas I hope this Easy Apple Strudel Pie recipe will be a staple go-to recipe that has a home-made filling with prepared phyllo dough crust. 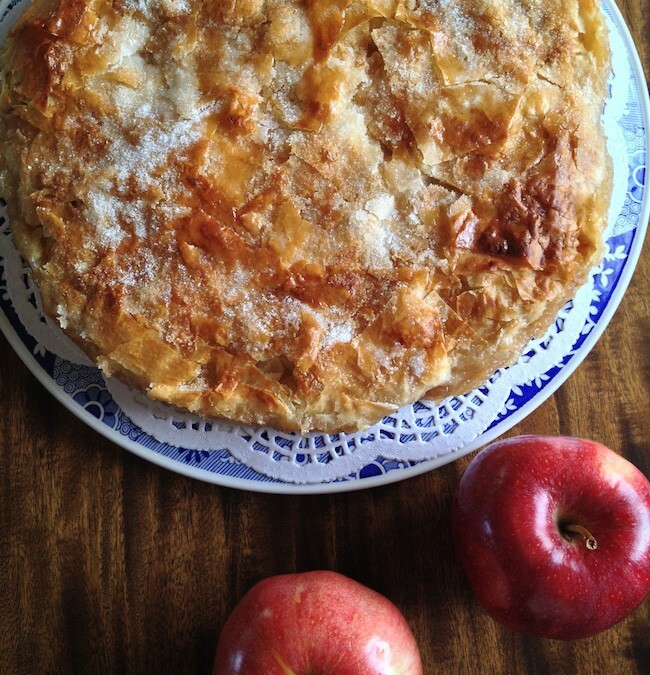 What I liked about this recipe is like an oversized apple turnover. One roll of the perfected store bought phyllo dough is all you will need and phyllo dough saves about 85 calories per slice without sacrificing taste. This dough takes about 10-15 minutes to prepare, but you will have a tasty and beautiful pie “crust” without the work of traditional pie crust. I do have a great recipe for pie crust. It’s a perfected dough recipe from Cooks Country Kitchen TV show. Let’s start with the apples. You’ll need about 5-6 medium to larges apples peeled and sliced thinly. I used golden yellow delicious apples as I am at high altitude, so softer apples will cook to just tender for the 55 minute time requirement. Peel, core and slice apples 1/2″ thick and place them in a bath of water with the juice of half a lemon to prevent browning while you prepare the apples. Once the apples are prepared, drain the water and pat lightly to remove as much water as possible. Combine the seasonings and add them to the apples. Toss the apples so they are coated evenly. Set aside. Prepare the phyllo dough. If you can work quickly, you will not have to cover the dough with a damp towel. I worked quickly enough, so I skipped this step, but the dough can dry out in less than 1o minutes making the dough very brittle and the dough will tear. Prepare a working area large enough for the pie dish and unrolled dough. I place my dough on a few paper towels so when spraying the individual dough sheets with cooking spray, the over spray will fall on the paper towels and not on the counter for easier clean-up. Carefully, spray the bottom of the pie pan with cooking spray. Place the first piece of phyllo dough on the 9″ pie pan allowing the dough to hang over the sides of the pie pan evenly. Spray the top of the dough again with cooking spray and brush with the honey mixture. Lay the next sheet of dough over the first rotating over an inch or two creating a fan effect. Continue this process of cooking spray and honey mixture with each sheet of phyllo dough, reserving five sheets. Once the last piece of phyllo dough is placed, brush the bottom of the dough with soften butter covering the entire bottom and sides of the dough. Place the apple mixture in the dough holding back the apple liquid. It’s “okay” to have a some liquid but not a lot as this will make the dough soggy. Place a a few pats of butter over the apples. Fold edges of the phyllo dough the over apples covering as much as the apples as possible. Use the remaining five dough sheets to cover any exposed apples. It’s okay if the sheets tear, just cover the apples as best you can and spray each sheet with cooking spray. Cut a small vent hole at the top for steam venting. Place your pie on a cookie sheet that is lined with foil or parchment paper to catch any hot apple filling spill over. Bake for 55 – 65 minutes or until the center of the pie filling reaches 175 degrees or when you can see the filling is bubbling. Allow pie to cool completely before serving. 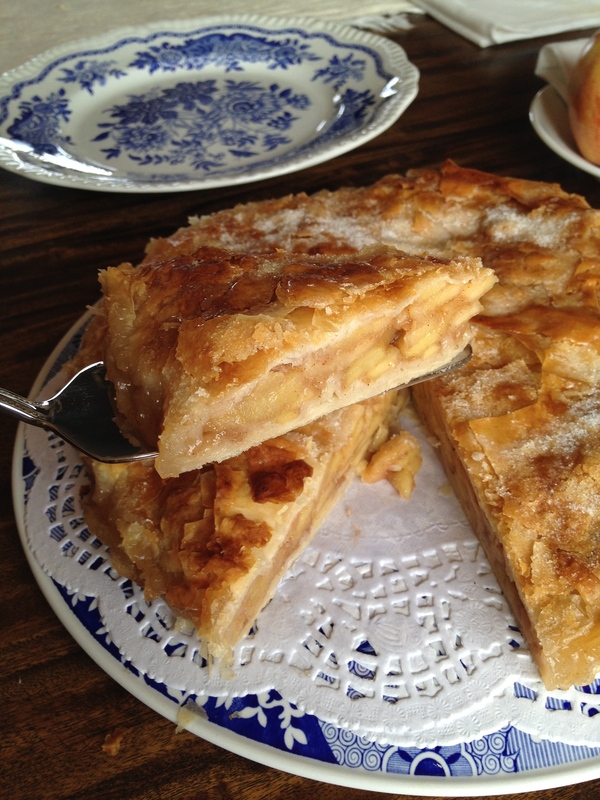 Baking tip: Have you ever baked a fruit pie and cut into it hot or still very warm? Most likely the filling is cooked and tastes really good, but if you desire the traditional gelatinous texture of a good pie filling, you must allow the pie to cool to room temperature, preferably allow to SET-UP over night at room temperature, in order to acquire this texture. Once you cut into the pie, you will never be able to attain a gelatinous filling. Step 2 Coat a 9-inch pie plate or pastry tart pan with nonstick cooking spray. Step 3 Peel and core apples thinly and place them in a bowl of cold water with the juice of 1/2 a lemon. Step 4 Combine apples, sugar, cinnamon, lemon and flour in a large bowl and set aside. Step 5 In a small bowl, mix honey with warm water. Step 6 Unroll the dough very carefully, trying not to tear dough sheets. Step 7 Working quickly, lay the phyllo dough sheets over the pie plate with the dough edges overhanging evenly on each side. Spray dough with nonstick butter spray and brush the dough with the honey mixture. Step 8 Spraying each layer of dough with non-stick spray and brushing with honey turning each sheet of dough 1-2" creating a fan effect covering the bottom of the pie pan to prevent any liquid from seeping out. Continue until all but a few sheets remain (about 5 dough sheets). Step 9 Add the apple mixture into the pie plate. Place 4-5 small pats of butter over the apples for added flavor. Step 10 Gather overhanging phyllo sheets up to the center of the pie. Step 11 (Optional) Add the remaining 5 phyllo dough sheets over any open areas of the pie to cover. I gathered the dough loosely to create folds for added texture. Step 12 Bake for 30-35 minutes or until the temperature reaches 175 degrees. Or, until filling bubbles. Step 13 Cool to room temperature, or overnight. Do not refrigerate of the dough will become soggy.